Gene Black an Alabama Artist and Quilter: A Finish -Hooray! Yesterday (aka:Saturday) - I started a project to make a table topper from a kit that was given to me. Yesterday - I finished it! The quilting is mostly free motion. I started with a funky version of a "square flower" in the center - but I added my own quirkiness to it. Then I used wavy lines and swirls for the chevron areas and the small squares. For the outer border, the free motion foot was used for some organic "sorta straight" lines. I think the muse is whispering in my ear again. ---but why doesn't she say "Let's finish some of those projects you started and haven't finished yet." Why? Great job Gene! So glad that someone is sewing!! BTW, you're a winner at my blog. Gotta love a project that is quick to do from start to finish. I know "quick" is a relative thing, and you put many hours in, but still, the next day you are finished? Amazing. 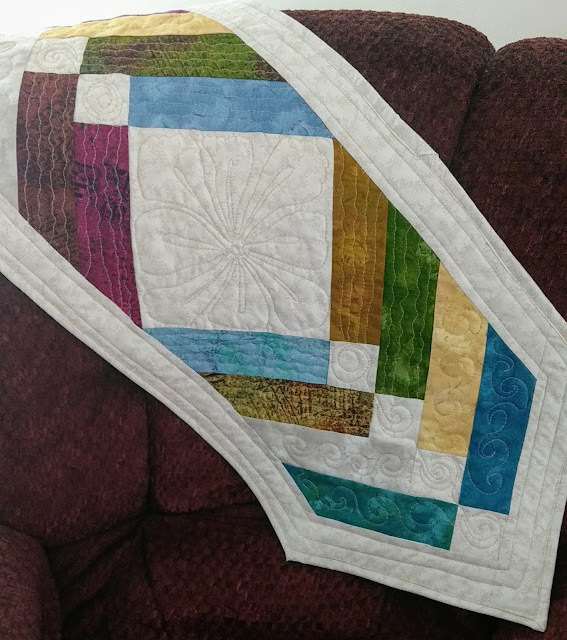 I love your quilting on this runner...what fun you must have had.